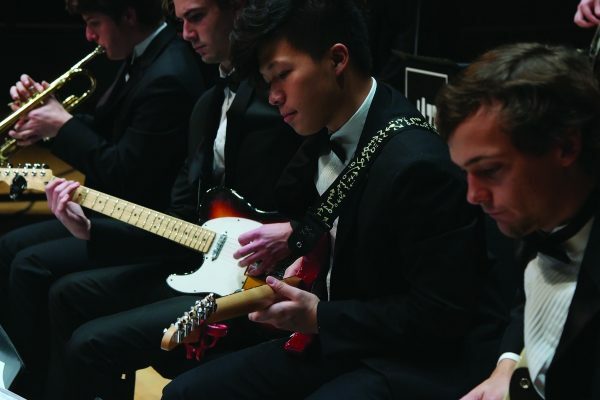 Washington and Lee University Music Department will present University Jazz Ensemble’s “Solo Avenue” on April 5 at 8 p.m. in the Wilson Concert Hall. No tickets are required. Led by guest director, Denny Euprasert, the Jazz Ensemble’s concert features the individual talents of the many sublime soloists who make up the ensemble, as well as special guest soloists Greg Parker and Chris Dobbins. Audience members will hear a wide range of genres and original compositions by Euprasert, as each soloist steps into the spotlight. Euprasert, visiting assistant professor of music, has taught at Rangsit University, where he was also the dean of Conservatory of Music and the director of RSU Jazz Orchestra. He earned a doctor of arts degree in music theory and composition, with a secondary emphasis in jazz pedagogy, from the University of Northern Colorado, a master’s of music degree in jazz studies from University of North Texas, and a bachelor of fine arts degree in jazz piano performance from Cornish College of the Arts. Euprasert’s recording project, “Masterpiece: Asanee-Wason,” received the Kom Chad Luek Award for Best Instrumental Album. He is the recipient of the Silpathorn Contemporary Artist Award from the Ministry of Culture of Thailand, one of the country’s most prestigious honors in the arts, for his notable contributions to fine arts and culture.